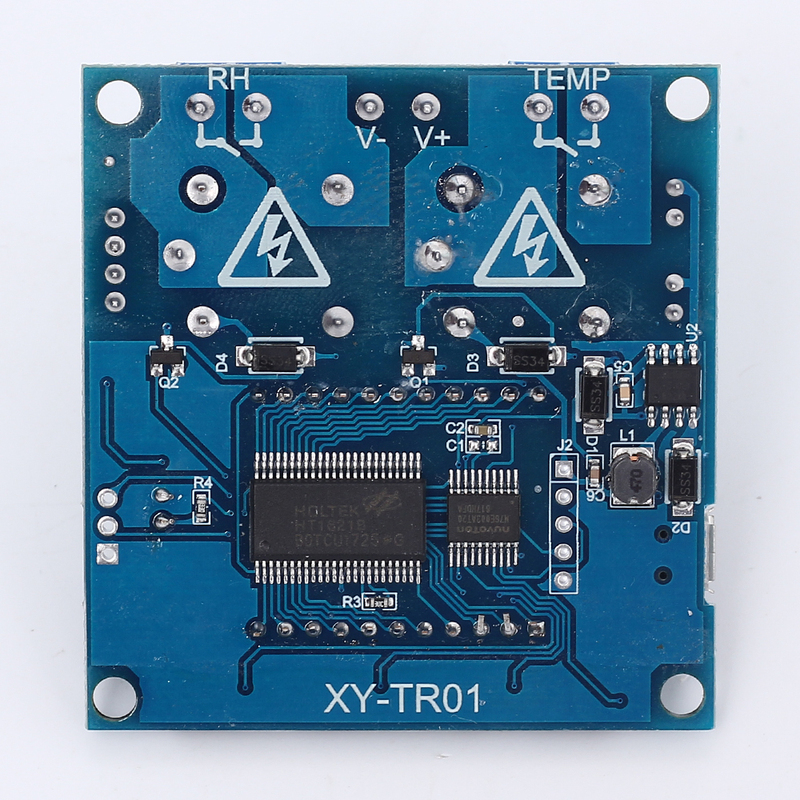 XY-TR01 Temperature and humidity control module high precision digital display word double output automatic constant temperature and humidity control panel. 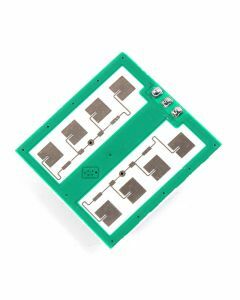 Product adopts industrial-grade chip, high-precision SHT20 temperature and humidity sensor. 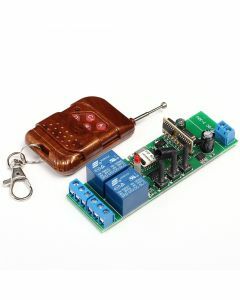 The module automatically selects the working mode according to the Start Temperature and Stop Temperature. Start Temperature is more than stop temperature, Turn ON cooling mode 'C'. Start temperature is less than stop temperature, Turn ON heating mode 'H'. 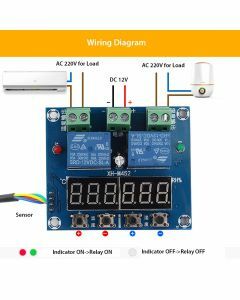 Relay turn ON and Red Indicator turn ON and Refrigeration equipment starts working if connect load when Current Temperature is more than Start Temperature. Relay turn OFF and Red Indicator turn OFF and Refrigeration equipment stops working if connect load when Current Temperature is less than Stop Temperature. 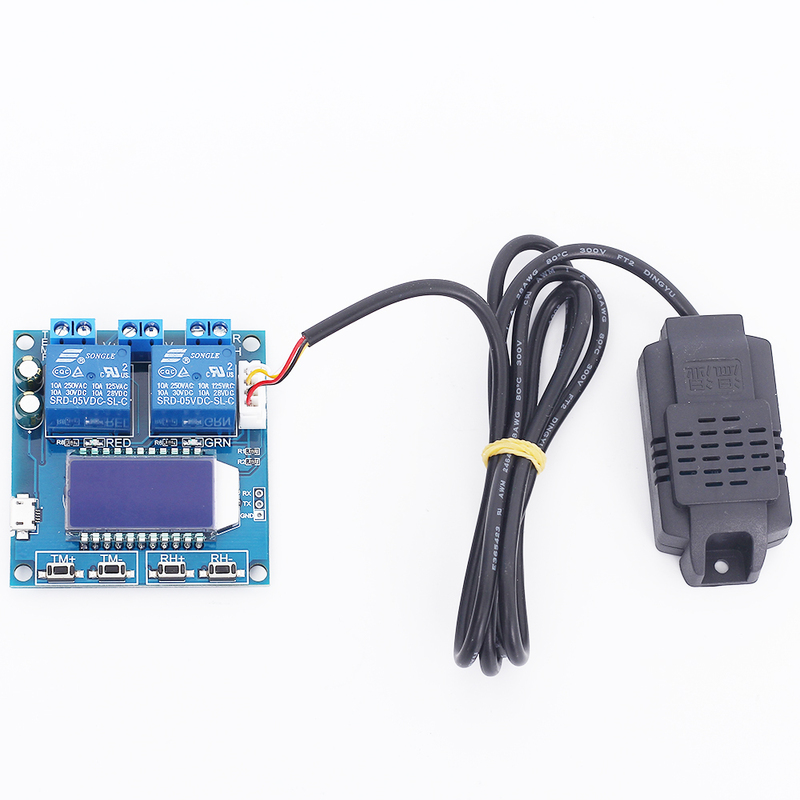 Relay turn ON and Red Indicator turn ON and Heating equipment starts working if connect load when Current Temperature is less than Start Temperature. 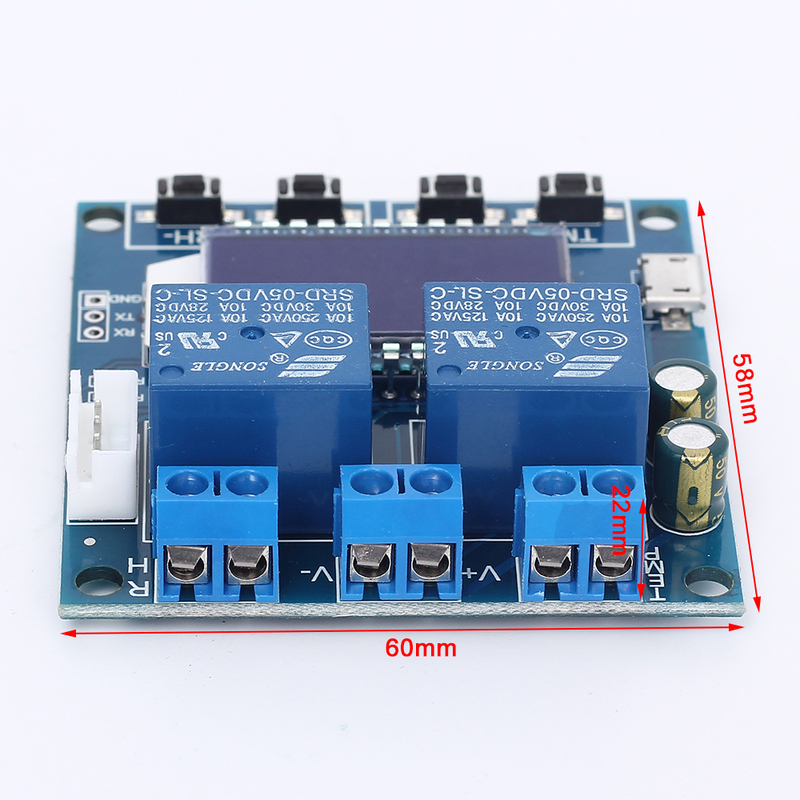 Relay turn OFF and Red Indicator turn OFF and Heating equipment stops working if connect load when Current Temperature is more than Stop Temperature. The system may have errors if it works for a long time, it can be corrected by this function. Actual Temperature = Measured Temperature + Calibration Value. 4.1>.Double-click button 'TM+' in the normal running interface into Temperature Correction setting interface.The first line shows the type of correction value(OFE or RH).The second line shows the specific value. 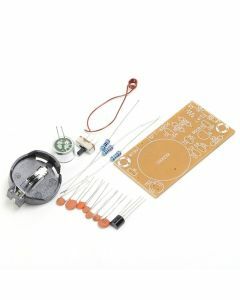 4.2>.Switch to select modified parameters by short press button ‘TM-’. 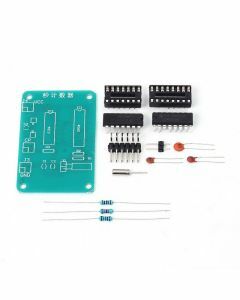 4.3>.Short press button ‘RH+’ and ‘RH-’ to set the specific value.Support long press. 4.4>.After the parameters have been modified, double-click button ‘TM+’ to save the data and exit the correction value setting interface. Keep press button 'TM+' for 3second in the normal running interface into Start Temperature setting interface.Short press button 'TM+' or 'TM-' to set parameters value.After the parameters are modified and then wait for 6s to automatically save and exit. Keep press button 'TM-' for 3second in the normal running interface into Stop Temperature setting interface.Short press button 'TM+' or 'TM-' to set parameters value.After the parameters are modified and then wait for 6s to automatically save and exit. 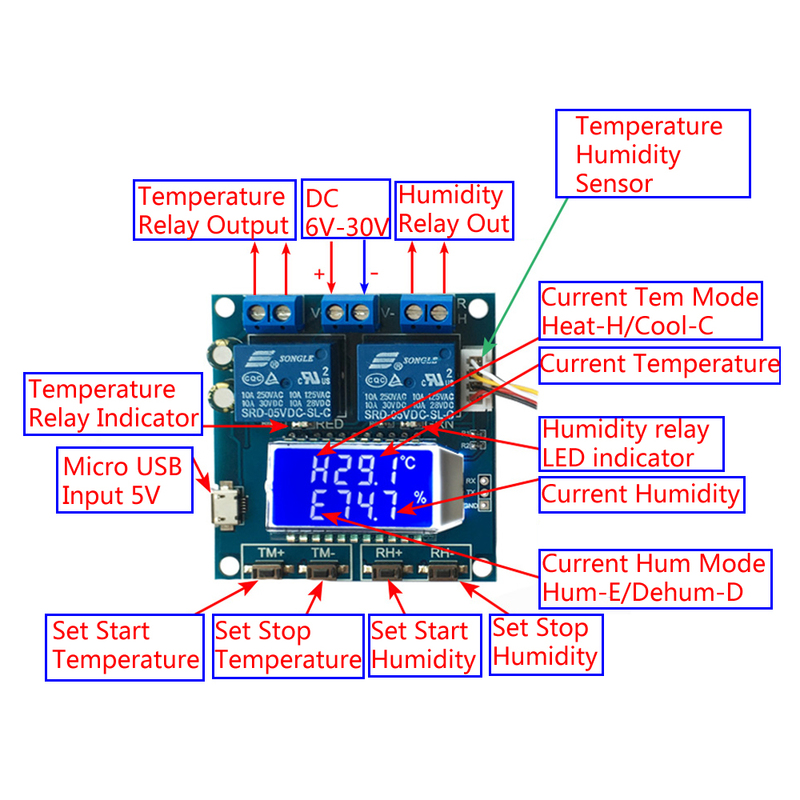 Short press button ‘TM-’ in the normal running interface.Turn ON or OFF temperature relay output enable.Screen will display ‘℃’ and flashes if If the temperature relay is OFF. 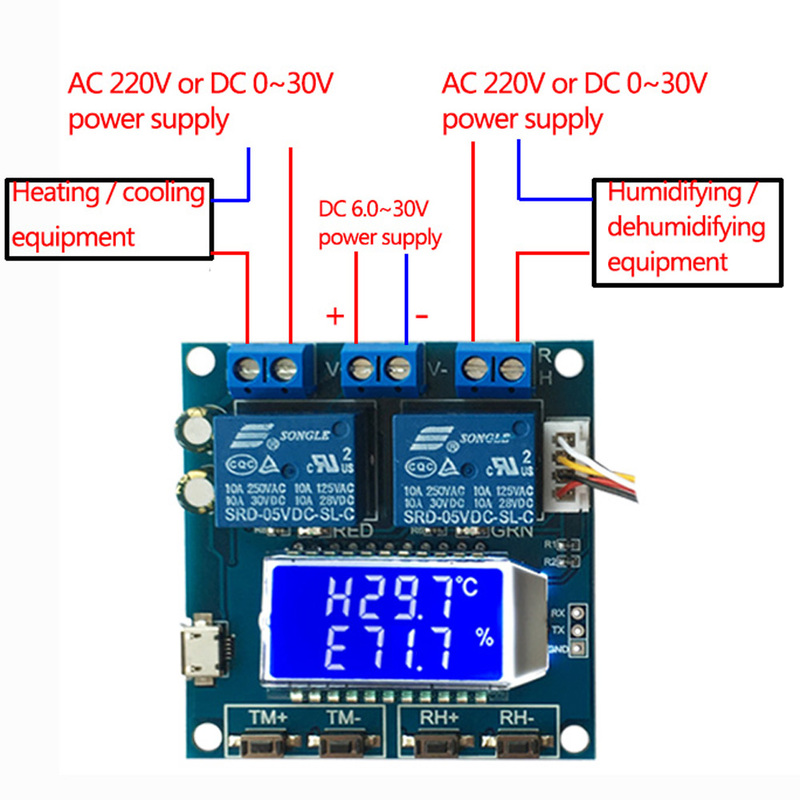 The module automatically selects the working mode according to the Start Humidity and Stop Humidity. Start Humidity is more than stop Humidity, Turn ON dehumidification mode 'd'. 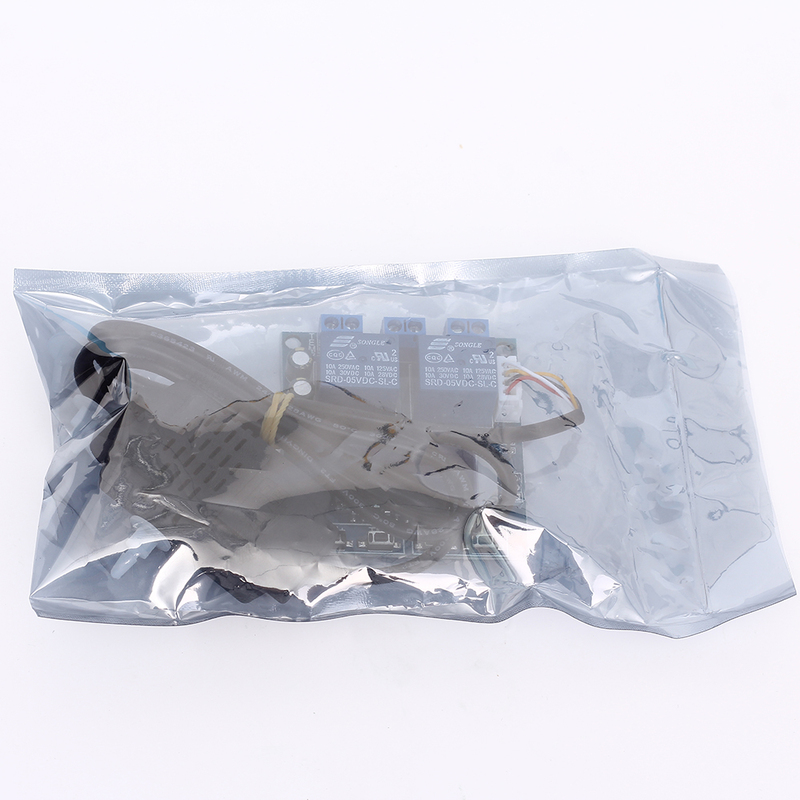 Start Humidity is less than stop Humidity, Turn ON humidification mode 'E'. Relay turn ON and Green Indicator turn ON and Dehumidification equipment starts working if connect load when Current Humidity is more than Start Humidity. 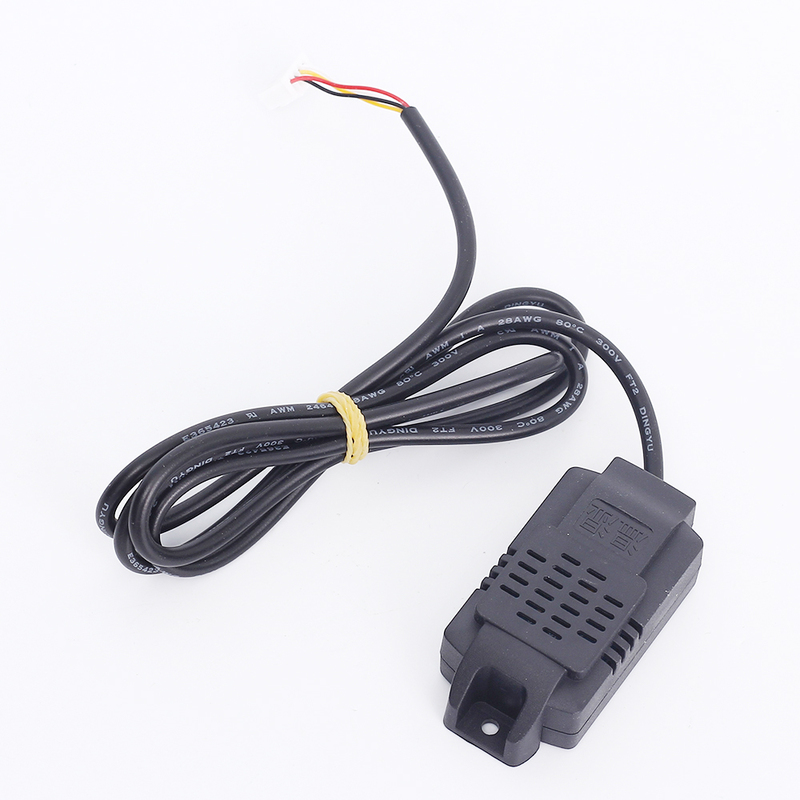 Relay turn OFF and RED Indicator turn OFF and Dehumidification equipment stops working if connect load when Current Humidity is less than Stop Humidity. Relay turn ON and Green Indicator turn ON and Humidification equipment starts working if connect load when Current Humidity is less than Start Humidity. Relay turn OFF and Green Indicator turn OFF and Humidification equipment stops working if connect load when Current Humidity is more than Stop Humidity. Actual Humidity= Measured Humidity+ Calibration Value. Keep press button 'RH+' for 3second in the normal running interface into Start Humidity setting interface.Short press button 'RH+' or 'RH-' to set parameters value.After the parameters are modified and then wait for 6s to automatically save and exit. Keep press button 'RH-' for 3second in the normal running interface into Stop Humidity setting interface.Short press button 'RH+' or 'RH-' to set parameters value.After the parameters are modified and then wait for 6s to automatically save and exit. Short press button ‘RH-’ in the normal running interface.Turn ON or OFF humidity relay output enable.Screen will display ‘%’ and flashes if If the temperature relay is OFF. 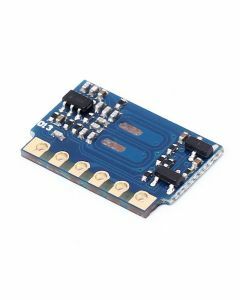 1>.Set or read data by UART. 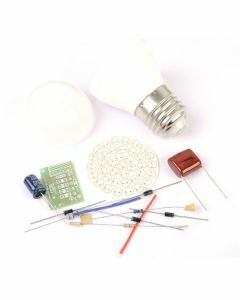 Parameters such as start temperature/humidity, stop temperature/humidity, temperature/humidity correction, etc. 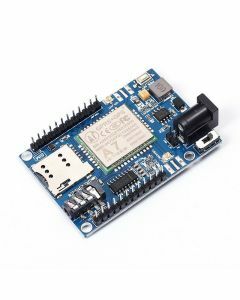 can be set through the UART. 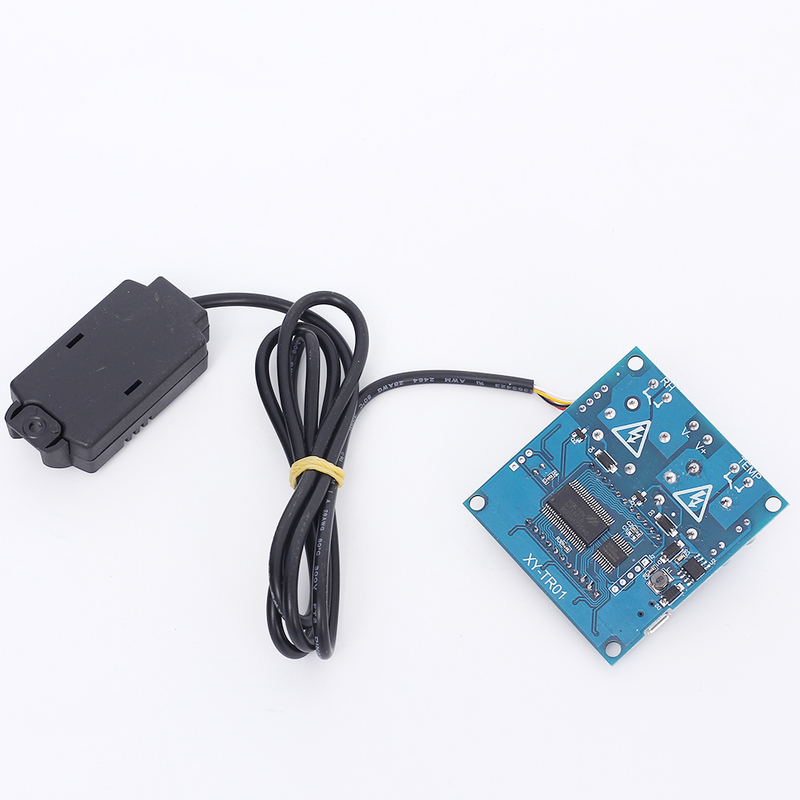 The controller module will report the current temperature/humidity to the terminal equipment by the UART at intervals of 1 second to facilitate data acquisition if the temperature/humidity reporting function is turned ON. If the relay enable is turned off, the relay remains off. 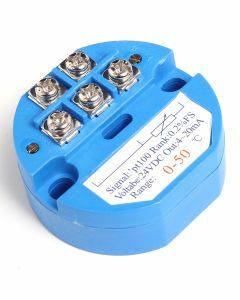 That is, the output state will never change, no matter what the measured temperature/humidity is. H, 20.5℃, CL: Heating Mode, Current Temperature 20.5℃, Temperature relay is OFF. D,50.4%,OP:Dehumidification mode,Current Humidity 50.4%RH,Humidity relay is ON. 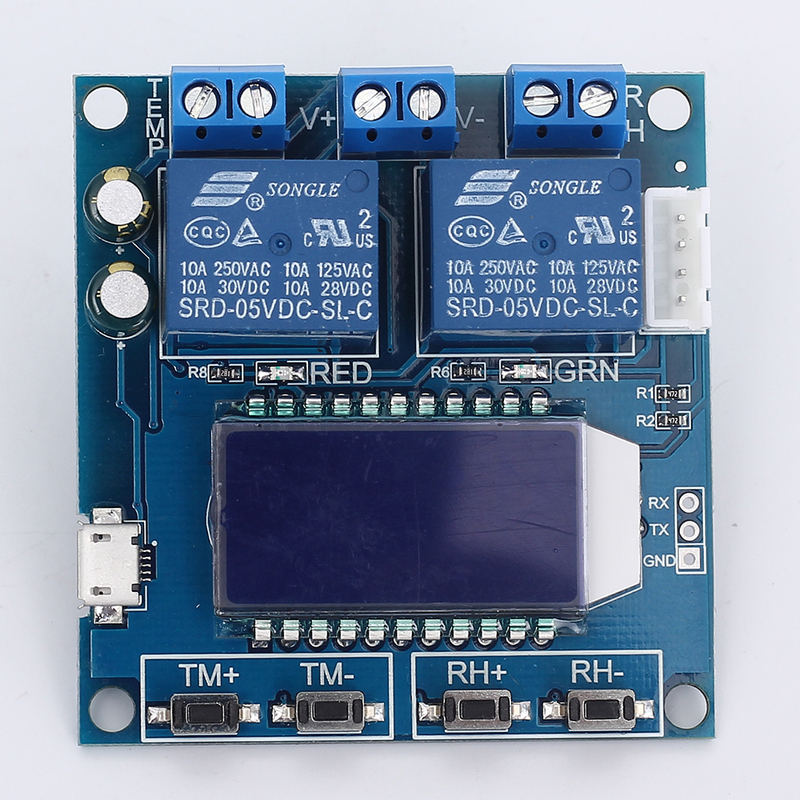 1>.It is a relay output mode and cannot be used as a power module. It cannot output voltage. The load needs to be connected to a separate power supply.